Vancouver has always boasted an incredible range of ethnic cuisine from all over the world, including Mexican, Chinese, Malaysian, Japanese, Indian, Italian, French, Vietnamese, Greek, and so on. But one country remains rather underrepresented: Spain. Spanish cuisine is hard to find in Vancouver, and some restaurants that claim to be "Spanish" actually serve Mexican food, which is very different. Luckily, there are a few hidden gems in the city, and Cafe Barcelona, a new tapas bar, is one of them. About the restaurant: Cafe Barcelona is a tiny restaurant nestled in the bustle of downtown Granville Street, sandwiched between pubs, hot dog outlets and fringe shopping. You'd easily walk by it if you didn't know what you were looking for. The interior is slightly dark, with rich wood tones on the panelling and chairs, and the walls are covered with lovely photographs of Barcelona and its unique Gaudi architechture. The restaurant owner is an extremely pleasant and friendly Spanish ex-pat from Valencia who treats each customer like they're the only ones in the restaurant; the service is excellent and very prompt. The food: Cafe Barcelona specializes in tapas, making it the perfect choice for finger-food lovers and people who enjoy smaller, lighter meals. The menu is uniquely Spanish with plenty of authentic dishes such as gambas ajillo (prawns sauteed in garlic and parsley), patatas bravas (diced and fried potato with spicy tomato sauce and allioli mayo) and tortilla de patatas, aka Spanish omelette (a thick, almost cake-like omelette with diced potato and onion). 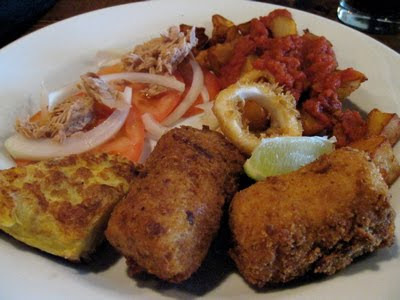 People looking for something a bit more familiar will appreciate the delicious calamari, the ham croquettes, and the Barcelona salad (very similar to Russian salad, with cold tuna and fresh onion on tomato slices). Cafe Barcelona also offers a wide range of pintxos, individual-sized dishes usually served on a small slice of bread. The different types of dishes offer a lot of variety for the tastebuds, from the crispy tang of the fresh onions in the salad to the warm, soothing taste of the Spanish omlette. The fried items in particular are excellent, with crispy exteriors and soft, tender insides. I especially like the calamari, which are giant and chewy without too much batter. The cold tapas and pintxos are also very appealing, with fresh ingredients and appealing textures. My favorite is txaca, a smooth mix of crab, red pepper and mayonnaise piled on top of the bread. The pepper give it an extra tang that sets off the refreshing cold taste of the crab. Cafe Barcelona also offers a few desserts. 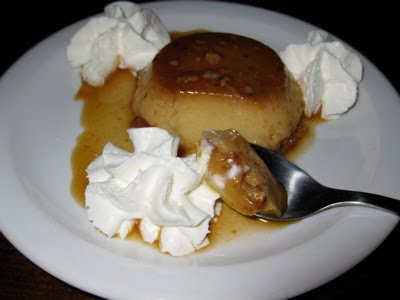 The tarte de Santiago was a bit of a letdown (an almond tart without too much flavor and a slightly rough texture) but the homemade flan is really great. My favourites: Calamares, patatas bravas, tortilla de patatas, txaca, crotquetas (jamon), flan, tapas daily special. Cost: Tapas is a great way to eat on a budget, and Cafe Barcelona is no exception to the rule. The most expensive tapas is only $8-11, and though it may be a bit too small to make a meal by itself, sharing two or three with a group makes for a very filling and satisfying meal. If you want a reasonably priced way to sample several at once, try the daily special tapas plate at $10, which features three or four different tapas. The pintxos are even more reasonable, at about $2-3 each. Location(s): Cafe Barcelona is located on Granville Street near Smithe. Link to Google Maps. Summary: As a lover of all things Spanish, finding Cafe Barcelona was fantastic. It brings a little taste of Spain to downtown Vancouver. It's about time Spanish cuisine got some international attention, and what better time than now, when hungry fans from all over the world are here for the Olympics? No matter how many wonderful and varied things there are to eat in the world, sometimes there's just nothing like a nice burger, and the bigger the better. Vera's Burger Shack has become one of the best places in Vancouver to indulge in your hunger for burgers, and Olympic fans with an appetite, a love for beef patties and a sense of humor will find themselves very pleased indeed! About the restaurant: Vera's Burger Shack is a local Vancouver-owned franchise of restaurants sprinkled all over the city, particularly downtown and in Kitsilano. They all share a very basic and sparse decor that echoes that of a 50's burger joint, with simple booth seating at small square tables. The walls are covered with tongue-in-cheek menus and posters listing all the available trimmings and asserting that their version of a "low fat" burger involves taking off the bun. All in all, it's not the best in terms of comfort or atmosphere, as there isn't much in terms of music or television and the seats aren't the most comfortable, but it's certainly servicable for what it is. The servers at the cash register are friendly and boast a cheerful sense of humor, often joking with customers and laughing. However, there is no table service; you come up to the counter to pick up your meal. Also, the food here takes a bit longer to prepare than other fast food restaurants, so be prepared to wait a little while. Many people take this into account and prefer to phone ahead (or order online). The food: Like Memphis Blues, Vera's Burger Shack makes absolutely no pretense at being a "healthy" eating establishment. This is not where you come when you're on diet; this is where you come when you're dying for a giant juicy burger and a mountain of crispy fries drizzled with sauce. And boy, does Vera's nail it. Their burger menu reads like a love letter to meat, cheese and veggies, with dishes like the Cantor (which is topped with a giant slice of salami and fried onions), the BBQ burger (provolone, BBQ sauce, fried onions and bacon) and the Baja Burger (cheese, guacamole, salsa and hot peppers). You can also customize your burger with a huge variety of toppings, including "The Usual Suspects" (ketchup, mustard, lettuce, etc) and more unusual trimmings like roasted garlic, fried egg and blue cheese. You can also select different patties such as veggie, lamb and turkey, allowing for further customization. Naturally, by the time you're finished crafting your monster burger, it's the size of... well, a monster. Taken from Vera's Burger Shack. All the ingredients are fresh and tasty, and the burger is moist, savory and absolutely perfect. The beef patties particularly are of really high quality, with a taste that evokes that of a sirloin steak. The juice soaks into the toppings and bun and makes the experience a satisfying (if somewhat messy!) affair. Just try to have one on an empty stomach, as the sheer weight of meat and toppings is extremely rich and filling. If burgers aren't your thing, try one of Vera's hot dogs, which applies the same love of mountainous toppings to wieners. Vera's fries also deserve special mention; they're thick and crispy, with the skin still on, and fantastic for any fry fanatic. And yes, you can also order poutine here! Round it up with some yam fries, onion rings, milkshakes and so on, and you have a superlative burger experience! My favourites: The Cantor, the Vera Burger, the BBQ burger, Vera's fries. Cost: Vera's burgers are a bit more expensive than in comparable places (certainly far more than McDonalds) but that befits the excellent ingredients and giant size. The basic burgers cost about $6, while the speciality burgers loaded with meat and cheese go from anywhere from $9 to $11. Upgrading to a combo (drink and fries) is an extra $4. You can often get slightly better deals by ordering their daily special; each day features one burger at a reduced price. Take-out? : Yes. Not only that, but you can order ahead online or over the phone. Location(s): There are several branches of Vera's located downtown, in Kitsilano, and in other areas of the city including the airport. Link to Google Maps. Summary: Burger lovers both local and international should take the time to try Vera's Burger Shack. One bite and you'll be converted. Just be sure to use the napkin... you'll need it! Hello, Olympic fans! Sick of lineups yet? While waiting to get into a place can always be frustrating, it's often a good sign when you're looking for a good restaurant; after all, if a restaurant is popular enough to attract a large number of people as well as keep them waiting, it's got to be something pretty special! In the case of Sophie's Cosmic Cafe, a favorite with locals, the attraction is a friendly and welcoming staff, a funky decor, and large breakfasts guaranteed to send you away with a full stomach. About the restaurant: Despite the name, Sophie's Cosmic Cafe does not go in for futuristic or sci-fi decor. Instead, like the Old Spaghetti Factory, it focuses on nostalgic and vintage memorabilia, but with a simpler approach. The walls are festooned with random knicknacks like old tricycles, license plates and children's toys. The old collectibles are coupled with a sort of kitchy 50's diner color scheme, making it seem like a bit of a trip back in time. The waiters and waitresses are very welcoming and friendly, although they can get a bit harried and busy at times. The atmosphere is very homey, with people chatting and laughing. All in all, this is the sort of place where even a first visit makes you feel like a regular, part of the relaxed and warm feeling. Note that lineups are particularly long on Sundays, as their Sunday brunches are very popular. The food: Sophie's offers great fare common with casual family diners. Some people have had so-so experiences (reviews on Urbanspoon speak of frozen fries and cold scrambled eggs) but my breakfast and brunch visits have always left me full and very happy. The portions are huge and perfect for an empty stomach, and the food is very savory and satisfying. I'm particularly fond of their Belgian waffles, which are topped with fresh strawberries and blueberries and tastes delightfully sweet. The hash browns are also really tasty, with just the right amount of seasoning. The best part of breakfast at Sophie's, though, is having a tall frosty milkshake with your meal. As a huge milkshake fan, I appreciate the chance to indulge; the milkshakes are thick and sweet and provide an unusual but tasty counterpoint to the breakfast meal. They also come in a wide variety of flavors, including coconut, almond and orange. Taken from Erika on Urbanspoon. While Sophie's is most famous for its breakfasts, its lunches and dinners are nothing to sneeze at, offering a respectable selection of burgers, sandwiches, and even entrees like oyster soup and roasted chicken. Save room for dessert, though... with such tempting items like Belgian chocolate cheesecake and an absolute *mountain* of an apple pie, there's plenty to appeal to your sweet tooth! One last thing Sophie's is famous for is its hot sauce, which goes well with everything from eggs to fries. If you find yourself falling in love with it, you can buy a bottle for $5, making a nice and cheap culinary souvenir. My favourites: Belgian waffle, vanilla milkshake. Cost: While slightly more expensive than similar diners, Sophie's still offers a nice bang for your buck thanks to its large portions. Most dishes are around $10, with some of the more expensive dishes clocking in at $20. Location(s): Sophie's Cosmic Cafe is in Kitsilano, on 4th Avenue not far from Granville Island. Link to Google Maps. Website and menu: The main site is currently down for reworking, but you can still access chunks of the site here, including pictures of some of the menu favorites. Summary: Sophie's Cosmic Cafe has been a Vancouver favorite for years, drawing locals to line up cheerfully every day for its warm atmosphere and satisfying breakfasts. Olympic visitors wanting to see where we go when we're not partying in the streets should take the time and brave one more lineup... I think you'll find it worth the trip! LiveCity Yaletown is proving one of the most popular and exciting party venues for the Vancouver Olympics. I made it there for the first time on Wednesday and cheered along with hundreds of other Canadians as we took the silver medal for speed skating. But all that cheering makes a fan hungry. What was the food like? The venue: LiveCity Yaletown, near David Lam Park. The impression: I was expecting the same kind of food at LiveCity Yaletown as LiveCity Vancouver, so imagine my surprise when the concessions featured a variety of international cuisine! Separate windows offered food from Greece (gyros and donairs), India (mostly curries), Italy (pizzas and calzones), China (noodles, fried rice and dim sum items), Jamaica (jerk chicken and patties) and Canada (hot dogs, burgers etc). I really appreciated the nod to Canada's multi-cultural background (but what, no Japanese?!) as well as the attempt to offer some variety. I decided to try the bison burger from the Canadian booth and the shrimp dumplings from the Chinese. First things first... the bison burger was a big disappointment. I had high hopes as I love both beef and burgers and thought it would be something really cool and unusual, but the taste was underwhelming and the presentation was very bad. The burger patty was simply cut in half and shoved into a hot dog bun. It was very awkward to hold and eat, doubly so when I tried to add toppings as well. The patty itself was interesting, with a slightly saltier, gamier taste than regular beef burgers, but it wasn't worth what I paid for it. All in all, I was very let down. Luckily, the shrimp dumplings were there to save the day, and save it they did in fine fashion. Initially I was concerned as the "skin" seemed a bit rubbery, but as soon as I bit into the shrimp insides I was in heaven. Sweet, moist and tender, the dumplings were set off to perfection with a tangy soy sauce (you can also ask for spicy sauce). An experienced dim sum expert might not be impressed, but I certainly was, and would happily order these again. Not only that, but they seemed remarkably well priced compared to other overpriced options. The verdict: I much prefer the food here to that at LiveCity Vancouver; there's more variety, and there really are some gems here. Next time I come back, I want to try more of the Chinese food, or perhaps try some Jamaican, Greek or Italian dishes. Having said that, I do recommend giving the bison burger a miss; there's a lot better food to spend your money on. Hey everyone! Hope you're enjoying the Olympics as much as I am! For those planning to make it up to Cypress Mountain for the events, here's a quick review of the concession up there. The venue: Cypress Mountain, near the half-pipe/snowboard cross runs. The impression: Firstly, the venue gets unavoidable marks off due to concession location, although it's not really anyone's fault. See, the concession is situated behind the bleachers at the base of the hill, which wouldn't be so bad... if the bleachers didn't have over 200 stairs to climb to get up to your seat. What this means is that if you go, take your seat, then go back later for a bite to eat, you will be climbing over 400 stairs (or at least what feels like it!) and wiping yourself out. My legs felt like noodles by the time I got back to my seat. With this in mind, I'd recommend grabbing a bite to eat when you first arrive before you take to the stands; if not, at least try and get all your food in one go, and be sure to get enough drinks/etc for the rest of the event. Having said all that, the food itself was pretty darned good, almost worth the climb. I was not expecting great things from the clam chowder, but was very pleasantly surprised to find it was absolutely excellent. It had a nice and subtly spicy kick to it, and went down smooth without being cloying or overly thick. The pieces of clam and potato were a little small, but there was more than enough of them, and they were tender and fresh. The packaged crackers made a perfect addition to the soup. The hot chocolate was also excellent. The chocolate was extremely rich and strong with a sweet taste. My dad thought it was a little too sweet, but for me it was just right. The verdict: If you can bear the inflated prices and the long stair climb, the food at Cypress Mountain is more than satisfying enough to tide over sports fans. The clam chowder particularly is fantastic and well worth a taste. Just try to grab it on your way up! I thought it would be a good idea to cover some of the food available at the Olympic venues and pavillions. After all, restaurants are all well and good, but when you're on site sometimes all you have time for is a bite from the nearest concession stand. How do the venues stack up? The venue: LiveCity Downtown, near the corner of Georgia and Beatty. The meal: BBQ salmon and salad with bun. The impression: All right, first the obvious; this was definitely overpriced based on the portion and the quality. Having said that, it wasn't a total wallet-buster, and I didn't come away reeling in disgust over the price gouging, just mildly smarting. After all, it's to be expected that Olympic concessions are going to be a bit overpriced. I was surprised to see a dish like this on offer next to the hot dogs, burgers and other regular concession fare at LiveCity. It's nice to see a heathier and fresher option, not to mention one with a British Columbian flare to it. Certainly it makes for a great alternative to the "usual" fried dishes. My overall feeling was that it was okay. There wasn't anything wrong with it, mind you; the salad was fresh and the salmon wasn't rubbery or overly dry. It just didn't particularly stand out as amazing. The BBQ salmon was just short of being bland; it had a nice flavor but a bit too low key to really stand out. The salad is served with prepackaged Kraft dressing in either ranch or Italian. The bun was quite nice though, and as a whole the meal was of much better quality than I would expect from such a high-traffic concession area. The verdict: While overpriced, the food at LiveCity Vancouver is certainly decent enough to warrant a try if you're onsite and peckish. The chance to have something like BBQ salmon and salad at a concession is a pleasant change of pace, and certainly better than we could expect! If you're at LiveCity Vancouver and feeling peckish, give it a try! Despite originating in Portland, The Old Spaghetti Factory has long since evolved into a Vancouver institution, attracting both tourists and locals looking for a great meal at a ridiculously low price. With branches both in the trendy neighbourhood of Gastown and the snowy slopes of Whistler, this should be #1 destination for Olympic budget chasers and people looking for a great meal for the family. Richmond branch. Photo taken from Danny and Jeremy at Urbanspoon. About the restaurant: The Old Spaghetti Factory cheerfully embraces a sort of kitchy retro charm in recognition of its 39 year history, displaying a large collection of vintage posters, scales, gas pumps, bicycles and other items. The Gastown branch even has an old streetcar trolley set up inside the restaurant; diners can sit inside it and enjoy their meal in an atmospheric relic of Vancouver's past. Mood lighting, stained glass, menus smattered with turn of the century ads and simple checkerboard-cloth covered tables gives it a warm and homey atmosphere, made even more welcoming by the very cheerful staff. The Old Spaghetti Factory is very popular and as such there's often a bit of a wait to get in. Luckily, there are some comfortable seats for waiting customers, and usually it doesn't take very long. The restaurant can also be a little noisy at times, especially during children's birthday parties. 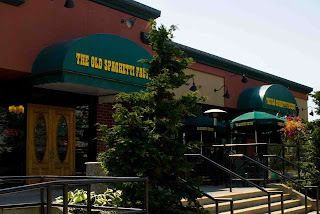 The food: The Old Spaghetti Factory excels at providing hearty and satisfying meals with a simple and homemade taste. They make their own soups, salad dressings and spaghetti sauces, all of which are fresh, thick and flavorful. I'm a huge fan of their clam sauce as it is so thick and creamy that it echoes a great clam chowder. The pasta is soft and tender as are the meat dishes. Special mention also goes to their bread which is always warm from the oven and served with garlic butter (my favorite!). There's nothing pretentious or overly fancy here, and there doesn't need to be; this is the kind of food that everyone can enjoy, from the eager foodie to the picky eight-year-old. Picture taken from Fit and Fabulous. Not only is the food good but the servings are absolutely fantastic for the amount of money you pay. With an order of spaghetti (which covers a rather large dinner plate), you also receive a sizable pile of salad smothered in fresh dressing and a dish of spumoni ice cream (similar to Neopolitan except with pistachio instead of strawberry), as well as bread and tea or coffee. I am particularly fond of the thousand island salad dressing, and the ice cream is an unusual but incredibly effective mix of sweet and slightly salty tastes, and the perfect finish to a large and satisfying meal. My favourites: Spaghetti with clam sauce, spumoni ice cream, Cookie Monster smoothie. Cost: This is where the Old Spaghetti Factory really shines over almost all its contemporaries. In my opinion, you cannot get better value for your money in all of Vancouver. A complete meal including bread, large salad, large plate of spaghetti, ice cream and beverage of choice goes for only $10. If you order some of the fancier pasta, it goes up to a mere $13-14. And again, these are all extremely generous portions, meaning that even those with large appetites will walk away satisfied. Take-out? : No, although you are welcome to take leftovers away. Location(s): The Old Spaghetti Factory offers several locations in popular areas, the main ones being in Gastown and Whistler, making this an ideal choice for Olympic visitors. Link to Google Maps for Vancouver and for Whistler. Summary: There's a lot of great reasons why the Old Spaghetti Factory has remained a popular Vancouver institution. Great atmosphere, excellent food and absolutely amazing pricing makes this a winner by any restaurant standards. If you like spaghetti, have an appetite, are looking for a great deal or just want a good family restaurant, make the time to try this place. Looking to grab a bite between your favorite sports events? How about grabbing some takeout or delivery for a cozy night of Olympic television back at your hotel? Cheap Eats 2010 is a local's personal guide to some Vancouver favorites at a budget everyone can afford. A freelance writer based in Vancouver, with a love of video games, anime, food, and all things geeky.